In early March our team was invited to attend a meeting along with other Focus on Energy Trade Ally contractors. At this meeting we were briefed on changes to the 2016 Home Performance with ENERGY STAR Program, and Trade Ally contractors were recognized for their 2015 achievements. 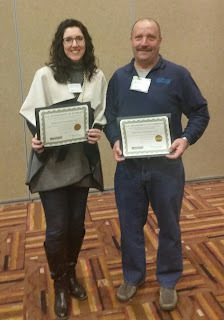 Rockweiler Insulation was honored as one of seven insulation contractors in Wisconsin to earn the Century Club Award. This award is presented to contractors who have completed 100 or more energy efficiency improvement projects in 2015. Not only is this a local award, we are officially recognized by the US Department of Energy for this achievement. In addition to our recognition, Pat Smith of Eau Claire Insulation was honored with a Century Club Aware. Smith Insulation is a fellow member of the National Insulation Contractors Exchange (NICE), an independent trade organization committed to supporting independent contractors through best practice sharing, training and improved business strategies. Insulation does more than lower energy bills – it is one investment that increases the value of a home. Hanley Wood recently released its annual Cost Versus Value report. This report compares the cost of 30 remodeling projects and how the investing in these projects retains value at resale. For the first time since the report has been done, adding fiberglass attic insulation was included in this list of projects. According to the real estate professionals who responded to the survey, this upgrade would increase the price of a home at resale. The study showed that within a year of the project’s completion, investing fiberglass attic insulation increased resale value by $1,482. When compared to other remodeling projects this is higher than any other in the study (a 116.9% return). In another report done by the National Association of Realtors (NAR), in conjunction with the National Association of the Remodeling Industry (NARI), upgrading insulation received another high grade. In this report, the results as measured by expected payback indicate an estimated cost of $2,100 for the project. This could translate to $2,000 in added value at the time of sale, resulting in a 95% percent cost recovery (not to mention the energy savings seen by the homeowner). We think improvements to home value support the belief that a home that is consistently comfortable and has lower energy bills strongly appeals to today’s homeowners.